The below process is used to create\import timesheets from Project Service Automation application (PSA) into Microsoft Dynamics 365 for Finance and Operations. Integrate a project from Project Service Automation application (PSA) to Microsoft Dynamics 365 for Finance and Operations and verify that the records are successfully integrated. 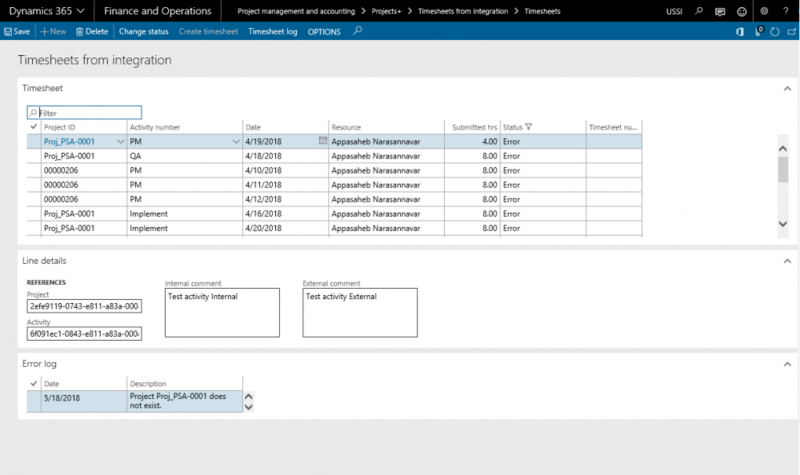 Set the project to be ‘In Progress’ status in Microsoft Dynamics 365 for Finance and Operations. Integrate a Work Breakdown Structure (WBS) data from Project Service Automation application (PSA) to Microsoft Dynamics 365 for Finance and Operations and verify that the records are successfully integrated. Create and submit the time entries in Project Service Automation application (PSA). Go to the submitted time entries and approve them as only approved time entries are considered for integrations. Go to Microsoft Dynamics 365 for Finance and Operations and in the Projects+ Integration module >>Periodic >> Synchronize WBS and Timesheet data from PSA. After synchronization, if there are errors, they can be seen in the either timesheets integration log or timesheets from integration. These forms will display the results of the timesheet periodic tasks for integrating Project Service Automation application (PSA) data. Users can view the details of batch process executed by selecting a record on the grid. The lines details and error information is shown on the Line Details and Error log sections respectively. Project ID Defaulted from Project Service Automation application (PSA) timesheet, if timesheet created for vacation and Absence then defaults from Projects+ integration parameters. Activity ID Defaulted from Project Service Automation application (PSA) timesheet, if timesheet created for vacation and Absence then default from Projects+ integration parameters. Resource Resource email id from Project Service Automation application (PSA) is mapped with Microsoft Dynamics 365 for Finance and Operations user. Timesheet hours Submitted and approved hours for the resource and for that period in Project Service Automation application (PSA). Timesheet period Timesheet period is decided by the Date on which the timesheet was submitted by user on Project Service Automation application (PSA). Externa comment Defaults from Project Service Automation application (PSA) timesheet records. Internal comment Defaults from Project Service Automation application (PSA) timesheet records.